Weird Wonderful Web: Xmas decorated tank! 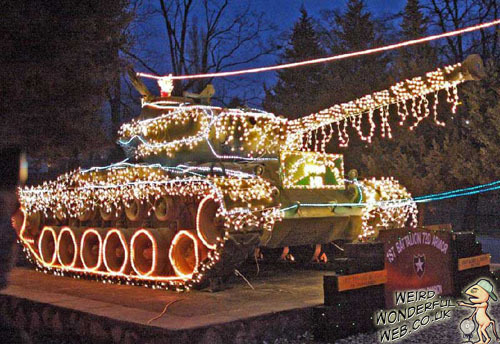 A heavily armoured Army tank made to look pretty for Christmas with fairy lights. We've posted many Xmas decorated cars, but here, as you can see is an Army tank beautifully decked out with Christmas fairy lights! Nothing says "peace and goodwill to all men" like a heavily armoured killing machine.